My colleague swapped over one of our clients to a new IP range last week, all went well except ActiveSync stopped working on the clients phones, it took a while for the penny to drop. But this problem was caused by the “fix” for the “Active Sync Support Code:85010014” that’s outlined in MS KB817379. You need to grant access to the servers new IP address. 2. 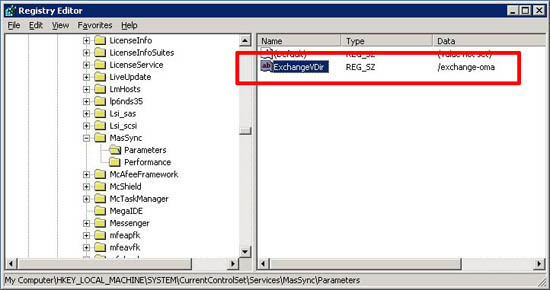 If there is a string value in the right hand windows called ExchangeVDir this IS the problem > Take note of what its set to (In the example below its called “exchange-oma”). 3. On the server, Start > Administrative Tools > Internet Information Services (IIS) Manger. 4. Expand your servername > Web Sites > Default Web site > Locate the directory you noted in step 2 > Right click > Properties > Directory Security > IP address and name restrictions > Edit > Ensure the servers new IP address and 127.0.0.1 are in there. 5. Click OK > Apply > OK > Close IIS manager. 6. Click Start > Run > services.msc > Locate the IIS admin service > Right click it > Restart.